Feature-rich, radial, special trailer tire provides excellent traction for a safe, smooth ride in both wet and dry conditions. Fits 13" wheels and has a maximum load capacity of 1,650 lbs at 70 psi. Lowest Prices for the best tires and wheels from Kenda. 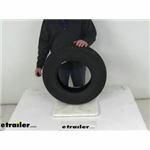 Karrier ST175/80R13 Radial Trailer Tire - Load Range D part number AM10210 can be ordered online at etrailer.com or call 800-298-8924 for expert service. Feature-rich, radial, special trailer tire provides excellent traction for a safe, smooth ride in both wet and dry conditions. Fits 13" wheels and has a maximum load capacity of 1,650 lbs at 70 psi. Fits: 13" x 4-1/2", 13" x 5" and 13" x 5-1/2"
Top-quality, bias trailer tire has been rigorously tested to ensure that it exceeds Department of Transportation standards. 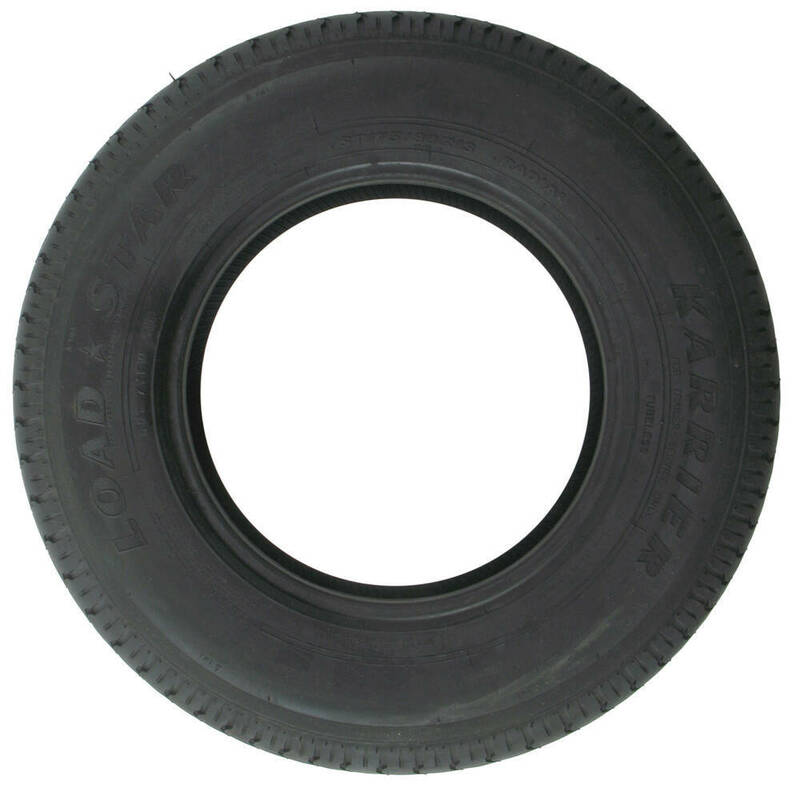 This tire fits 13" wheels; its maximum load is 1,610 lbs at 65 psi. Feature-rich, radial, special trailer tire provides excellent traction for a safe, smooth ride in both wet and dry conditions. Fits 14" wheels and has a maximum load capacity of 2,200 lbs at 75 psi. Radial special trailer tire has a ply rating of 14 and a 4,400-lb max load at 110 psi. Great for highway use. Fits 16" wheels. Today we're going to take a look at the Kenda Karrier ST175/80r13 radial trailer tire in a load range D. Now, this is a special trailer tire design. It'll provide the strength of a bias tire as well as the durability and stability of a radial tire. It is created specifically for trailers. It's not intended for use on any other vehicles. It does use the double steel belts, the full nylon plys to combine for superior function and long tire life. 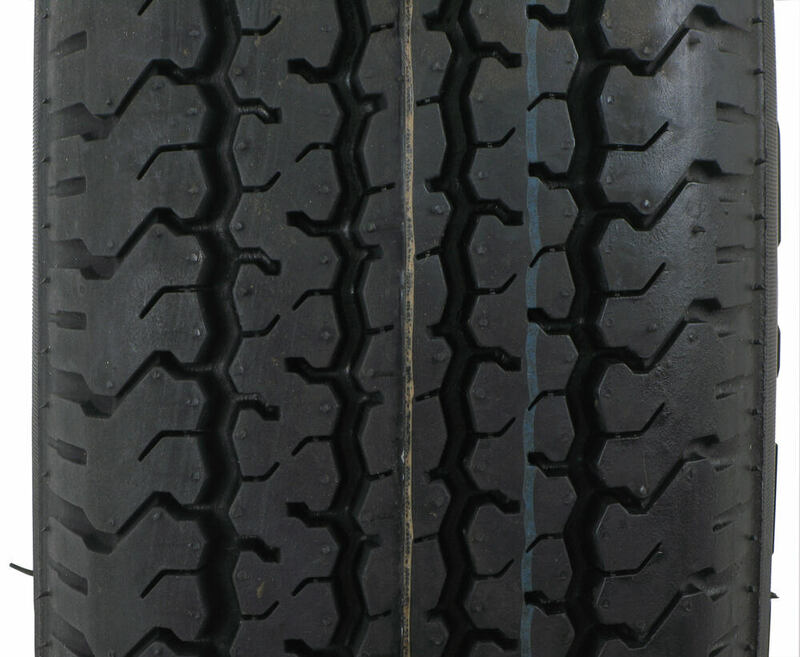 They do use a nice computer-generated tread design and premium rubber compound materials, which will give you maximum traction in wet or dry conditions. It gives a nice, smooth ride and excellent stability at highway speeds. 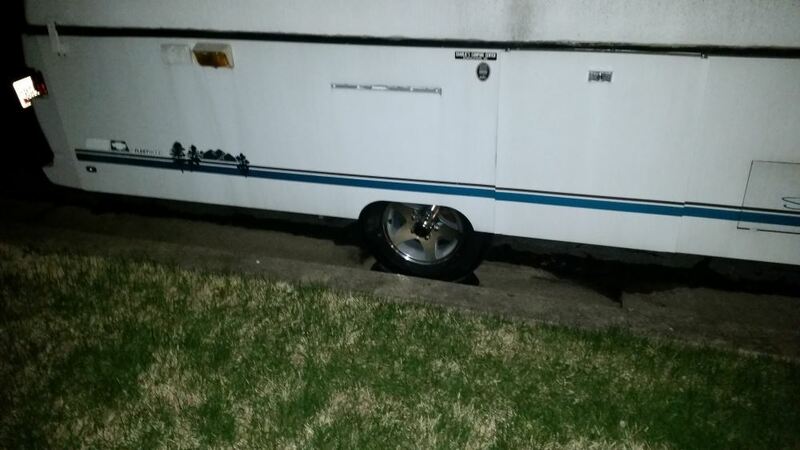 It is a trailer tire, so it does meet the Department of Transportation specifications.A few specs on this. 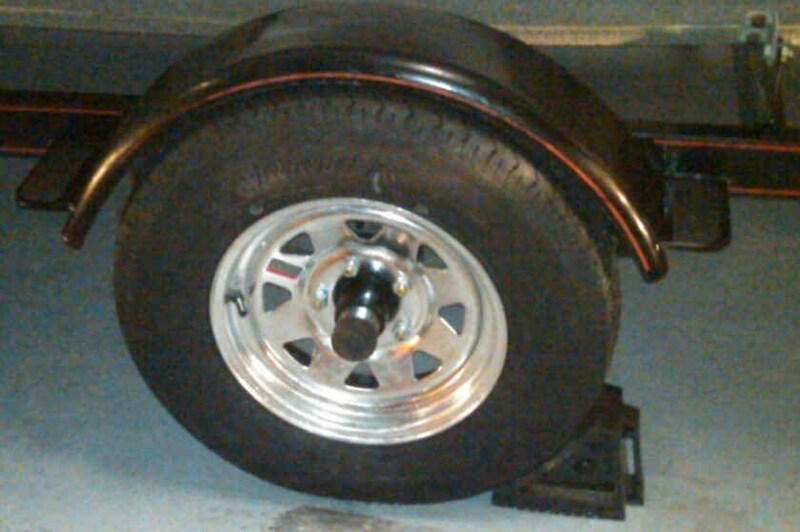 This tire is designed to fit on a wheel size of 13" x 4 1/2" wide, 13" x 5" wide, and 13" x 5 1/2" wide. The tire size should be stamped on here. ST for special trailer, 175/80r13. The "r" means it's a radial tire. Section width is going to be right at 7". Overall diameter from the bottom to the top when it's inflated is 24.1. This tire is a load range D, which means it's an 8-ply rated tire, and it does have a maximum load capacity of 1,650 pounds at 70 psi. And the last thing I do want to mention, most all the new trailer tires are coming through with a speed rating now, and the speed rating's always listed by a letter designation, and that's usually right after the tire size. So right here where we went through the tire size, if you look after it there's two numbers for a load index and then a letter M. Speed rating M will mean that it has an 81 mile per hour speed rating.But that should do it for the review on the Kenda Karrier ST175/80r13 radial trailer tire in a load range D.
Order: RelevanceNewestRating - High to LowRating - Low to High Feature-rich, radial, special trailer tire provides excellent traction for a safe, smooth ride in both wet and dry conditions. Fits 13" wheels and has a maximum load capacity of 1,650 lbs at 70 psi. Please keep in mind that running a tire with a higher load rating will not necessarily increase the load bearing capacity of your trailer. You will still be limited by the capacity of the lowest rated component. The tires still look like new after ~6000 miles. Ill buy these again when I need new tires. the 185 80 13 max psi of 65. New to towing, curious - the max psi is 65...what would you anyone recommend for cold tire pressure. This is for a popup camper, empty weight 2175 lbs. loaded - guessing 2,500 lbs.Car tires have max psi of 36, manufactuer recommends 32 cold.heres where the confusion sets inThanks! Car tires and trailer tires work a bit differently. The car manufacturer specifies where to air the tires to for the best combination of ride and performance. 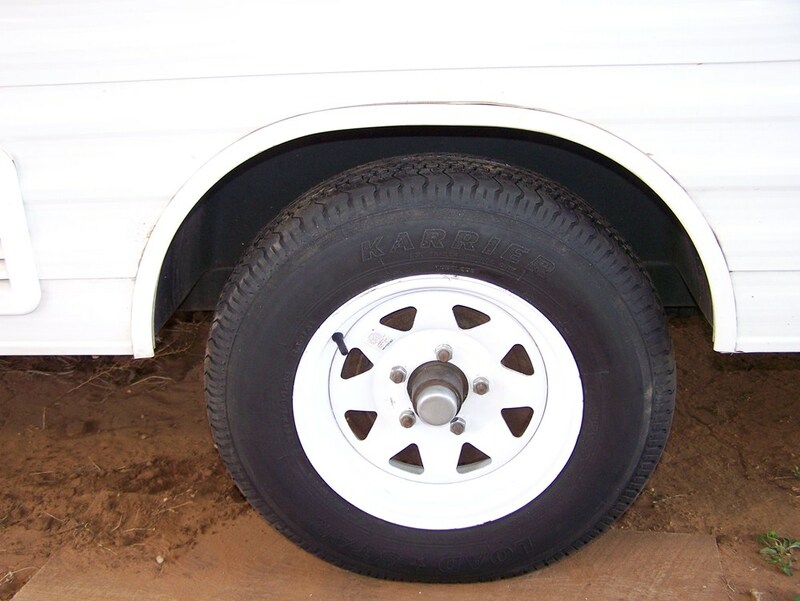 With trailer tires, their load capacity is in part determined by tire pressure. 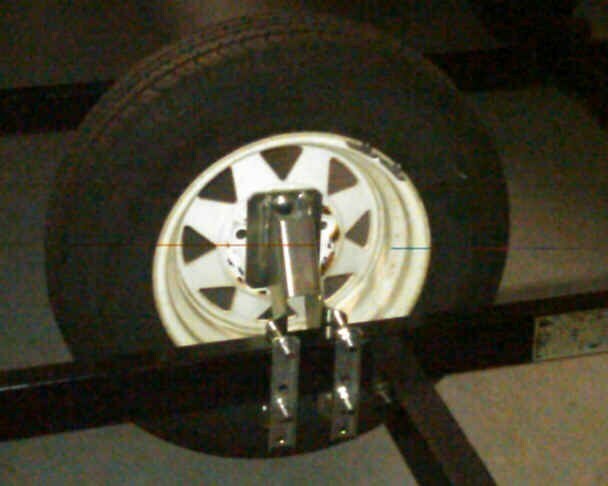 If the trailer tire has a max of 65 psi, you will need to air to 65 psi cold in order to achieve full weight capacity. If the pressure is less, so is the weight capacity of the tire. Pressures on the side of a tire are always cold figures. The tires purchased in 2014 have been good , however I sold the TT earlier this Spring. Having said that , this last Spring, I bought the same make for my utility trailer and my new to me tent trailer. I always have maintained the pressure at the maximum PSI for the maximum load. When on the road, I checked them daily , during the evening, 5 or 6 hrs after we stopped or first thing in the morning, before leaving. So far absolutely great tires. After a year on the road, still very happy with the performance of these tires. 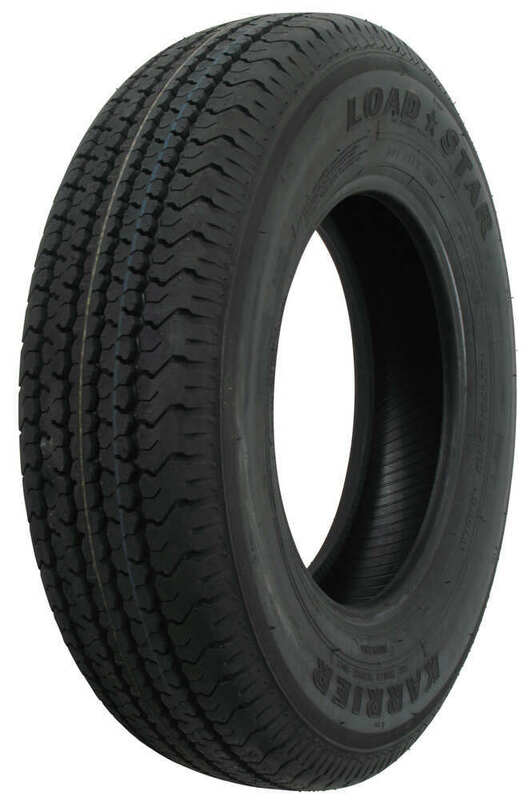 Either the Karrier ST175/80R13 Radial Trailer Tire - Load Range D, # AM10210, or the Loadstar ST175/80D13 Bias Trailer Tire - Load Range D, # AM1ST77, will work on your camper, but I would recommend the Karrier radial. It will give you a smoother ride than the bias tire and better stability with the newer design continous rib tread design.